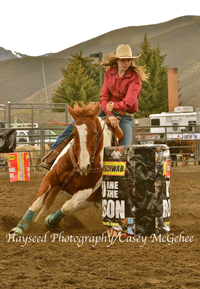 Gooding cowgirl Kortney McReynolds will look back on her visit to Hailey Rodeo Arena May 3-4 with good memories. McReynolds amassed 70 points over two rodeo performances to pull away from the rest of the 5th District high school rodeo girls’ field as the circuit visited the Hailey arena for the first time since 1997. In the fourth of six weekend rodeos this spring, McReynolds pulled away from a talented field of girls and stretched her circuit-leading overall total to 221 points, 43 ahead of second-place Cassie Bahe of Gooding (178). McReynolds led Bahe by 17 points before the Hailey stop. McReynolds performed well across the board in the timed events at Hailey. She won Friday’s goat tying in 8.33 seconds, captured Saturday’s breakaway roping in 5.070 seconds, placed second in Friday’s barrel racing in 16.781 and third in Saturday’s pole bending at 22.109 seconds. She even picked up her first team roping points of the spring, finishing sixth Saturday at 30.4 seconds with partner Katee Hubert of Dietrich. Currently McReynolds leads in none of the disciplines, but ranks second in poles, goats and breakaway, and third in barrels. The only cowgirls in striking range are Gooding’s Bailey Gough (141) and Jerome’s Cheyenne Logan, who had a 45-point Hailey weekend to climb into fourth (130). At Hailey, Carey’s Kylie Castle collected 23 points topped by a fifth place in Friday’s breakaway roping (14.270 seconds) and another fifth in breakaway Saturday (15.770). Fairfield’s Whitnee Hurless placed third in Friday’s barrel racing (16.819) and is fourth in the season barrels ranks. Overall boys’ leader is Gooding’s Brogan Bennett with 156 points, ahead of rookie Wyatt Williams of Gooding, 128. Bennett led the boys at Hailey with a 50-point pick-up including two 10-point wins in steer wrestling (10.380 and 9.450) and a couple of second places in team roping with partner Williams (12.130 and 9.120 seconds). Next, the district cowboys and cowgirls invade Blaine County Fairgrounds in Carey on Friday, May 10 at 7 p.m. and Saturday, May 11 at 2 p.m.
Then it’s on to Shoshone for the district finals May 24-25 followed by state rodeo June 10-15 at Bannock County Fairgrounds in Pocatello. Providing the stock for last weekend’s Hailey rodeo was the Williams and Ford Rodeo Co. from Shoshone. Announcer was Stan Born, and the judges were Hank Williams and Steve Birnie. Timers were Dawn Williams and Bev Swainston. Pick-up men were Casey Brunson and J-2 Brown, and the bullfighters were Kyle Spencer and Ben James. The saddle sponsors were Glanbia Foods of Richfield, Twin Falls and Gooding, and River Sage Stables of Bellevue. Buckle and ad sponsors were: L.L. Green Hardware, Atkinsons’ Markets, Clearwater Power Equipment, Bozzuto, Anderson and Co. CPAs, Hillside Auto Repair, Parts Plus of Hailey, Power Engineers, Sherbine Farms, Camas Creek Country Store, Martin Cutting Horses, Swift Sure Ranch, D.L. Evans Bank of Hailey, Sidetrack Bar of Gooding, and Western Stockmen’s Supply/Simplot.